Went out for a quick tasting with a friend at Chez Moeder Lambic, which is now wonderfully non-smoking. I recall the first time I went there, and I could barely see one side of the place from the other through the haze. 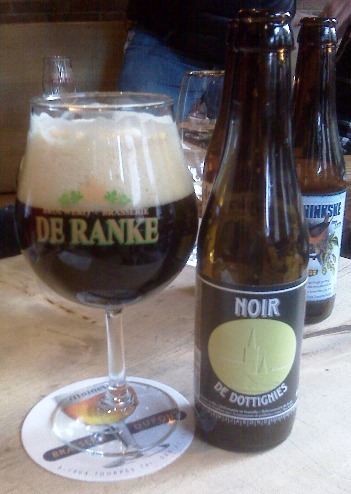 Again, though, I let the staff recommend a couple dark beers, and this Noir de Dottignies from the De Ranke brewery in West Flanders was an excellent offering. It pours dark, dark, dark. Pitch. The taste is immediately very bitter, then notes of biscuit, cooked peel, tobacco, burnt garlic and perhaps liquorice. Yes, there’s a lot going on in there. Yum.